Art Lab Gnesta is transforming the exhibition hall to an open studio space. Drop in workshop with Rebecka Holmström at 12-16 at Art Lab Gnesta. Drop in workshop with Annika Sundin and Emanuel Hallklint at 12-15 at Art Lab Gnesta. Opening: Stories from Gnesta and afar – part of momentum Gnesta. Arranged byt Långsjö theatre at 10-16 at Gnesta Library. Workshop with Akbar and Daniel at 14-17 at Vår lokal. Registration needed. Exhibition: Stories from Gnesta and afar – part of Momentum Gnesta. Arranged byt Långsjö theatre at Gnesta bibliotek. Workshop in community organizing with Tillsammansskapet, 12-30-16.30 at Art Lab Gnesta. Registration needed. Concert with the participants of the course Digital music-making. Gnesta literature – creative writing workshop with Axel Andersson at 13-15 at Art Lab Gnesta. Space flowers – painting workshop for kids 6-10 yrs with artist duo Folkloren. Kl 12-15 at Art Lab Gnesta. Registration needed. 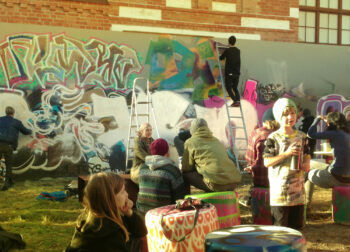 Workshop on the painting wall with Munish Wadhia and Emanuel Hallklint. 12-15 at Art Lab Gnesta. Gnesta literature – creative writing workshop with Axel Andersson. 13-15 at Art Lab Gnesta. Iron night festival, 12-16 at Art Lab Gnesta.